My Neighbor Totoro Wallpaper: Will the moon send my message? Minitokyo »	My Neighbor Totoro Wallpapers » My Neighbor Totoro Wallpaper: Will the moon send my message? So, about the wall, everything is painted, used this plus PS basic brushes, took me like 30 mins to do the grass, trees and sky, left it and then drew Totoro, then got blocked, left it in a corner and took it again to finish it :P thanks to Sir Gold knight for his input during my block. The original file of this was huge, you can see some 100% shots here. Hope you like it and good luck to everyone who is participating! your comments are always appreciated :3 thanks in advance for all your support. o.o won first place! yay! Awesome wall Angi, really good work with the pait and i love how you did the sky and nice tuch with the moon. Great work, cute bunny btw. I think your painting is very beautiful and it resulted in this lovely and realistic wallpaper. GREATT! I love this Wall ^^. You know, the Colors you use are very Matching And AWESOME! recently watched this anime and rather enjoyed it ! 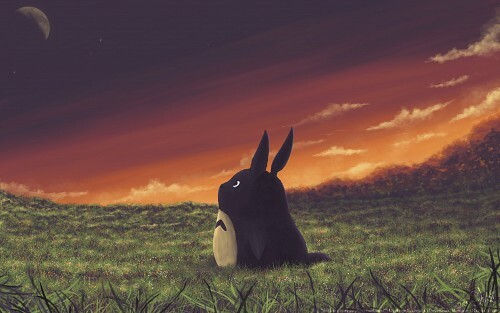 what a nifty idea you did with this, Totoro looks just too cute looking up at the sky. nicely done and really cute. +fav and I can see why it was elited. this is so awesome, perfect work! I think that this wallpaper is really awesome! Waaaaaaaah, such a pretty sunset! Mai-chan wants to be sitting there with Totoro-kun watching the moon too! Mai-chan loves the way that you used the colors that she chose xangel0-san! Congratulations on winning first place! hace como veintemil siglos que no entraba por aca... ups, Nice Work Angie-chan. You know I'm a Ghibli fan so obviously annakee is biased in your favor xDD Directo al kokoro.